The day started very early for me, as my body couldn’t adapt to the Cuban time, so at 5am I was already awake. I rolled over in my bed for some time and then decided it’s time to finally get up. My room was tiny, bust cosy, with a covered window that led to the courtyard. I got ready for the day and went out of the room, to find Bethan already in the dining area, reading a book. Our host prepared breakfast and I got a chance to know Bethan better. Everybody was staying in different casas. In Cuba, the Government has recently adopted a law that allows home owners to rent up to two of their spare rooms to tourists. For them, renting their rooms is an extra income but for tourists it’s a way of getting to know the real life in Cuba and stay with a family instead of in a boring state owned hotel room. 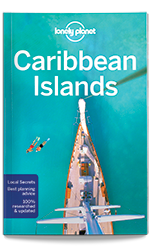 You get to know more about the locals and you also get to be a participant in their lives. The families that rent their spare rooms are taking a lot of care of their guests and by staying with them you can experience their hospitality and kindness. They will always cook breakfast themselves and put on the table everything they can afford to. It is also important to know that the state will not support them. As I said before, every Cuban is entitled to a ration card, with which, for example, they can buy 5 cheap eggs a month from September to December. But these people offer their guests 2 eggs every day for breakfast, which most of the time they have to buy from the tourist stores, in CUC (the tourist currency). So, when you are visiting a casa, don’t ask for more food that you can eat and also, if you have any spare toiletries or clothes or something that you don’t need anymore, they will be more than happy if you gift it to them. 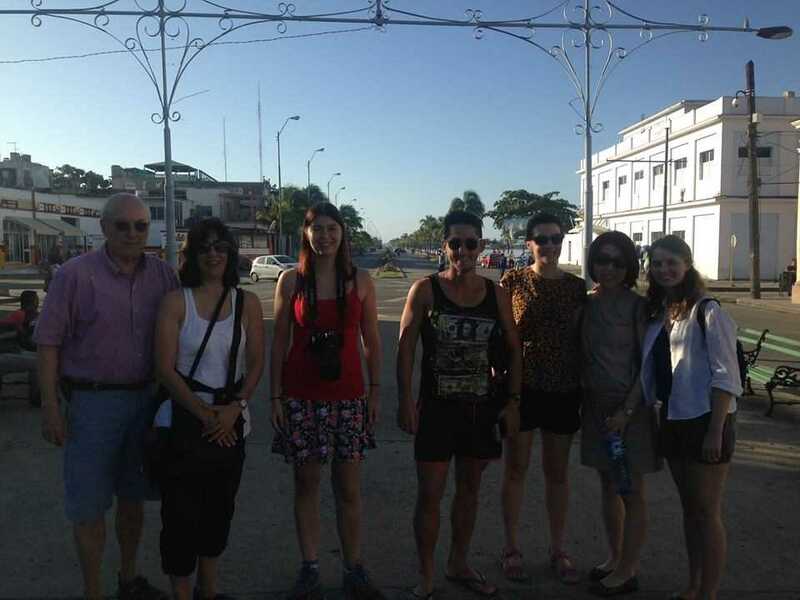 After breakfast, our group met with out guide, Danny, in order to explore Cienfuegos, as the night before we arrived to late and only had time to walk along the Malecon for 20 minutes, after dinner. 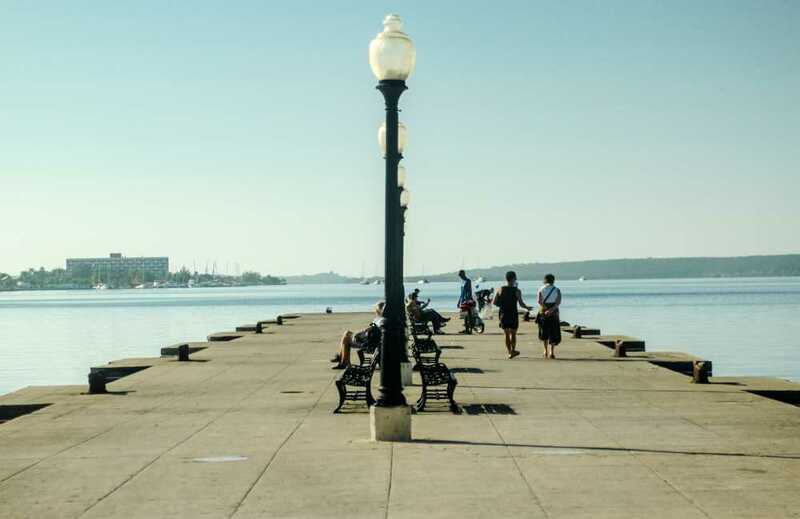 Cienfuegos (translated as “100 fires”) is part of the Unesco World Heritage List for its historic centre, as the best example of early 19th century Spanish Enlightenment implementation urban planning. We started walking towards the centre and I was keeping my eyes wide open to see the differences between the countryside and the capital. Before we crossed the street and head over to the Plaza de Armas, we stopped at the statue of Benny More, a famous Cuban singer born in Cienfuegos. We moved on to the Pedestrian Boulevard, where I could see for the first time the queues of people waiting for the ration shops to open. 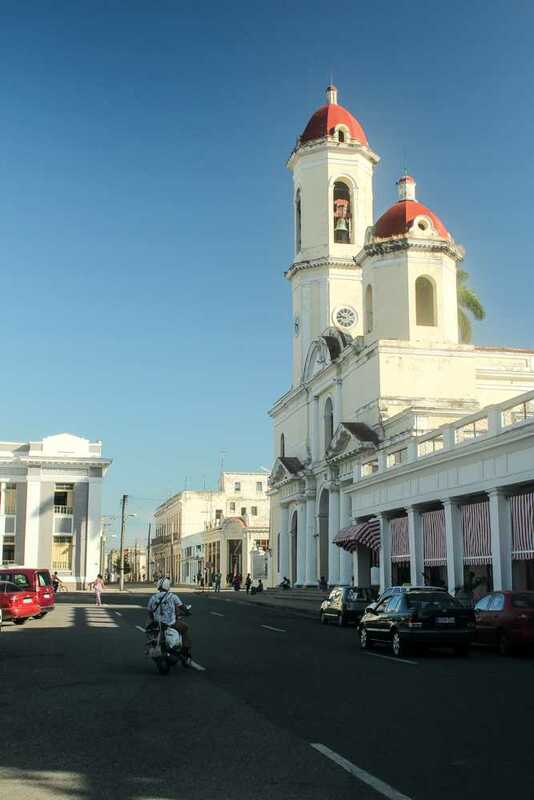 The town was very clean and bright, with light colored colonial buildings, nicely decorated with French motifs. We seemed to be the only tourists, almost blending in perfectly with the locals. We admired the church in Plaza de Armas, which reminded me of a small village church from the southern part of Peru, and then we turned left, heading towards the lake. The weather was beautiful, clear blue sky, high temperatures and a light breeze. The nearby buildings were painted blue and they made perfect sense to the city’s architecture. Unfortunately we didn’t have a lot of time to explore the town better, as the bus was waiting for us to take us to Santa Clara, to see the Che Guevara Mausoleum. You have probably heard the name of Che Guevara at least once in your life. He was an Argentinian doctor who, after his trip to South America, shocked by the poverty, disease and hunger that he saw, decided to do something about it. He became a symbol of Cuba and their most beloved leader, after he fought together with Fidel and Raul Castro to bring down the dictatorship regime of Fulgenico Batista, in 1958. The Mausoleum has two parts, one where his remains are kept and another one which is a museum with his personal items. Not many people are allowed to enter the Mausoleum in the same time, and as a result we had to wait for about half an hour in the powerful sun. It is not allowed to get inside if you are not wearing decent clothes and you have to take off your sunglasses and hat, as a sign of respect. The part where his remains are kept is designed to represent the Bolivian jungle, the place where he died. When you get inside you notice straight away the high humidity and the plants from the back (real?). The room is dark, the only light coming from the eternal flame, lit by Fidel in Che’s memory. On the left wall there are 38 stars, each representing the remains of a soldier found in the same place as Che’s, in Bolivia. Che’s star is in the middle, but is not bigger or different than the others. Once we stepped in the other room we noticed a cool breeze coming from the air conditioned. Here, the walls are covered with pictures from different moments of Che’s life, starting with his childhood and medical studies. On both sides of the room there are cases with different items that belonged to him: a bowl, a syringe, his medical license, his motorcycle helmet, even his writing desk. As you advance through the room, you get to see his evolution from a medical student to a fighter. The innocent objects now change, and you can recognise now his uniform, binoculars and lots of hand guns. Unfortunately, it is forbidden to take pictures inside the Mausoleum. Back on the bus, Danny gave us a copy of the letter that apparently Che Guevara wrote to Fidel before leaving Cuba. After the Revolution, Fidel took over the role of the country’s leader but after a while, Che disappeared. People have started to wonder and ask questions, comparing the sudden silence with a past event, involving Fidel and Camilo Cienfuegos, the Chief of Staff of the Cuban Army. Rumors say that Fidel might have been involved into Camilo’s death, after the plane he was in disappeared and was never found. A few weeks after Che’s noticeable disappearance, Fidel said that he was left a letter in which Che was saying that he wants to move on to help other countries too, that he gives up the Cuban citizenship as a sign of respect and that he does not want to leave anything to his wife and children. You can find the full text of the letter here. It is not known if this letter is real or not. From the Mausoleum we continued our way to Trinidad, one of the pearls of Cuba. I would have been put off at the thought of staying in someones house but seeing it from your point of view it makes more sense. I enjoyed the article and history I didn’t know. The way of life in Cuba is interesting! I think it would be great to be able to stay with the locals and really get to know how their life is. You get to know people on a different level when you stay with them and also get a chance for them to know you and learn about a different culture. I liked when you told about the history. I wonder if that letter is true or not. I wonder if we will ever know what happened to him. From my perspective, you are such a great storyteller. I love the scenery, the captures (the way you immortalized it). I just hope other historical sites would be as nice as this. Those photos are beautiful. I love that shade of blue on one of the buildings. I also never knew about the Che Guevara Mausoleum. How interesting that photography is not allowed inside. I suppose it is a mark of respect? I’ve always wanted to go to Cuba, but this post just made me more eager to do so. So many places to visit, and I hope I could do all those trips before I hit 60. And seems like Danny is such a nice and knowledgeable tour guide. Most of the time, trips become enjoybale because of the side comments and extra tips coming from tour guides. I love reading about personal experiences of travellers. I mean, I like to read articles that feature tips and suggestions when travelling to a certain place, but write ups like this makes me feel like I was there in Cuba with you. I love the pictures too. And the idea of renting a place with a local looks a lot more favorable than staying in a hotel especially if you’re travelling alone. Thank you so much for sharing your experience. More power to you! Look at those blue skies! Amazing! You really take us on the journey with you in your writing Joanna. I would probably be a bit stand off-ish staying with someone I didn’t know, but you make a very good point. Your photography as always is fantastic, looking forward to seeing the next part of your journey. That’s a real shame you can’t take pictures from the inside, whenever that’s the case I’d love to have a photo to keep on to the memory forever. I also clicked through to read the farewell letter, I wonder if that’s true! 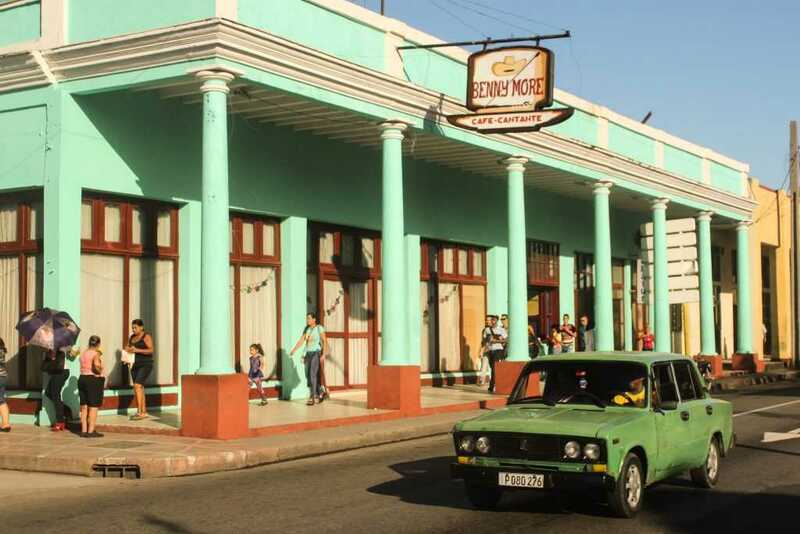 Looks like a festive, exciting, fun atmosphere in Cuba… I love all the color in the towns, it lifts your mood! It’s really cool that tourists are able stay with homeowners for an authentic experience. It’s really interesting learning about the history of Che and Fidel too! Wow!! What a neat coincidence! Hubby and I were just talking over dinner about wanting to go to Cuba and then I read this!!! So need to visit!! Look at the weather you had and the sky! So blue and beautiful. Great to have a good time in Cuba. I would love to visit Cuba once. The architecture is so colorful and amazing. Great pictures of the city life of Cuba! The closest to staying at a casa or someone else’s house when I’m traveling is when I’m staying with relatives – dunno if that even counts. I now find Cuba interesting and I’d definitely plan a trip to go there. It’s great though that the owner of the house where you stayed prepared breakfast for you but I think I’d be shy. It’s prolly how they do it in AirBnB. I’d definitely go to Cienfuegos when I go there. In my recent trip, I was able to visit several Unesco heritage sites and it would be great to add more to this list. I love that you are continuing to tell the story of your adventures in Cuba. I love seeing your photos of all of the interesting places that you talk about. I especially love the one photo of the over-sized red pot against the beautiful blue wall. Very striking! Cuba is in my bucket list. Thanks a ton for sharing about your trip, amazing pictures and your entire experience. Have pinned your post for my reference! I love continuing to read your journey of Cuba! You paint a beautiful picture that makes us want to visit. It seems like such a different world than we live in, and I think visiting somewhere that is so different is good for the soul. I hope that one day I will get to travel to such places myself. I love how they still stay reverent to Che’s memory, he was an incredible man and worked incredibly hard to bring down the dictatorship. I will be adding the Che Guevara Mausoleum to my list. I am a closet socialist, so I will be paying my respects to a hero. Your photos are amazing as always. I don’t see myself even near Cuba so it is exciting toread about your adventures. I feel like I am there too. I have visited Cuba but stayed on the resort. I would love to explore more – thanks for sharing. It seems it was a really interesting and educational trip. Good advice about giving unneeded items to the hosts. Something I wouldn’t have necessarily thought of, but I’m sure would be appreciated. Sounds like a great trip to Cuba! I learned some stuff about Che that I didn’t know. 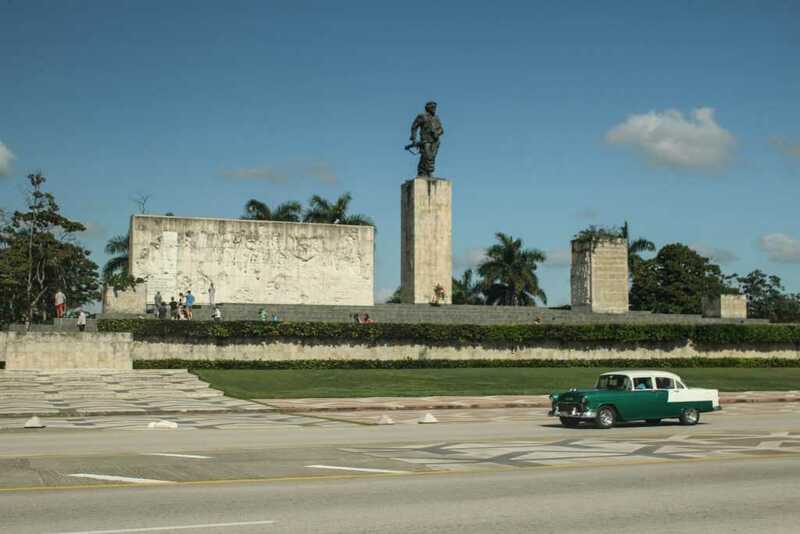 Cuba has always been a bit of mystery to me as I lived in Miami it was quite close and quite far at the same time. I have always enjoyed the photos of Cuban houses with the bright colors and beautiful caribbean sun. Great photos too! Great post! I really do want to make it to Cuba after reading so many great posts about it. Your pictures are lovely and I love that you’ve had the local experience here. Cuba looks so amazing! Loving the colourful blue and turquoise walls of the building! I loved the part of living with locals – I feel exactly the same way everywhere I go! I almost totally gave up staying in hotels since I discovered the pleasure of getting to know how people really live in rent appartements. Staying with locals is a great experience. It surely allows you to become more familiar with their culture. Cuba is a very beautiful place, as we can see at your great photos. Thank you for sharing them. Did you go to locals home for dinner? My friend tole me you can basically arrange it on the street and meet later in the apartment on cuban feast . Of course in secrecy as it was illegal to ear money this way till recently. Such a special experience and place to visit! I remember how much Cubans loved Che just from the number of places you see his picture or a statue dedicated to him. I wasn’t aware of the mausoleum though, I will make sure to visit next time I’m in Cuba! 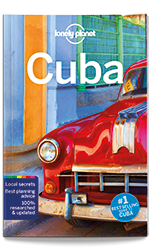 It is so fascinating to learn about Cuba, a place I have never been but have read many books on. I hope to visit one day. Thanks for the inspiration. I would love to visit the Mausoleum and learn even more about Che Guevara. He had such an interesting life! 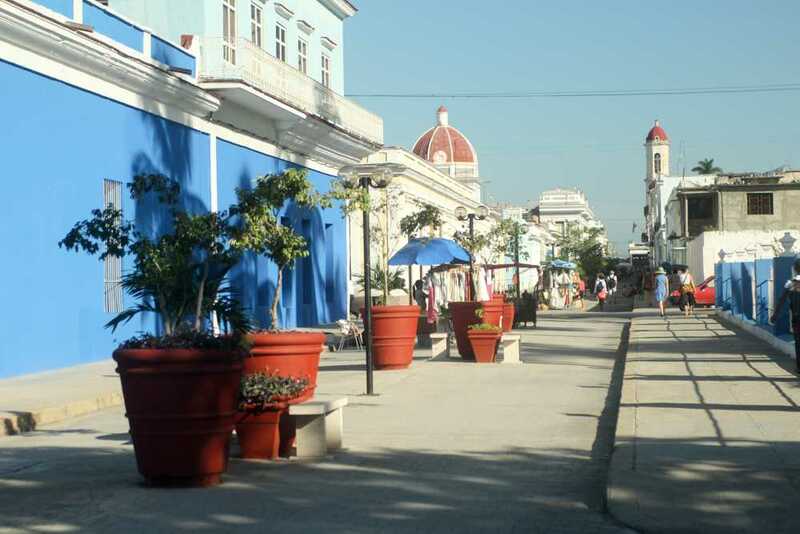 Cienfuegos looks beautiful, too. The homestay aspect of visiting Cuba sounds great. Its good way to promote local culture and education rather than turning Cuba into another obnoxious US-focused island trap. I like the idea of the government allowing people to rent out their spare spaces to tourists. Doing so, most likely means there is oversight, resulting in a more pleasant experience for tourist. I was looking at your photos, and once again, it is the colors that come to mind. I love the fact that you were able stay with a local, makes for such a great experience right. That is my favorite thing about staying at an airbnb too, you get to live like the locals and experience a part of the culture in the little time we have. Your narration is so beautiful and lovely pictures too. Great pictures and story! Interesting tidbit about the tourist renting. Did you feel safe? I so badly want to visit Cuba, it looks magic and had been on my bucket list forever. I love the idea of staying in someone’s Casa. The Chef Guevara Mausoleum sounds interesting for sure. I hate when jetlag messes up your sleeping rhythm. 5am wake ups are never fun. I love how authentic it feels staying with locals too. Feels like you’re a local too. Really loved your photos and hearing about your experience of Cuba. I’d love to go and hoping to find a good fare to visit in the next year! Pinned for when I find the flight! I have got some Cuban friends , I have heard a lot about the REAL Cuba . Such a beautiful country and so much going completely wrong . Such a shame , as you will have noticed , what a lovely mentality people from Cuba have got . So friendly and always willing to give , even that they haven’t got much themselves . I hope , things will change in the very near future , as some of my friends can’t go home to visit their families after their visa expired . Not easy for them . 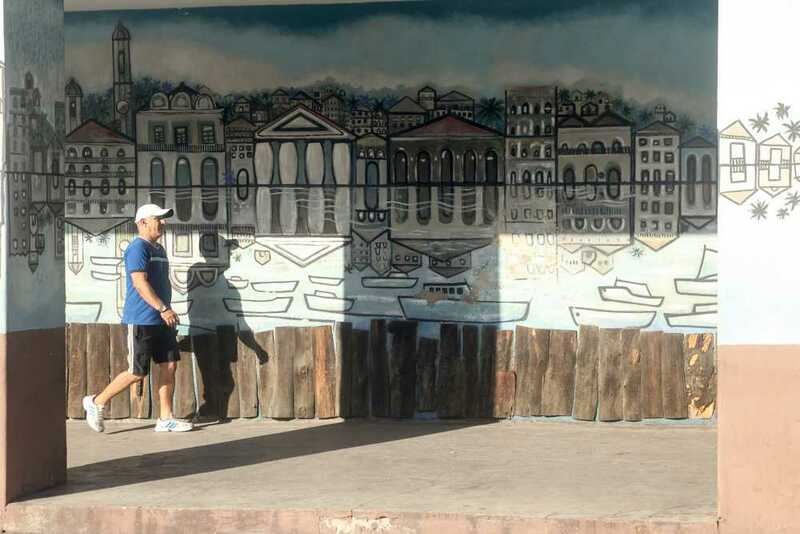 The area you showed there reminds me of a place in the Philippines, that is, Intramuros. The buildings and the look of the streets perfectly captured what Intramuros is. It’s not Couchsurfing, there is no concept of that in Cuba because there is no internet. These people are actually renting the rooms in their house and act the same way as a classic B&B, but getting more involved making sure you are comfortable and that nothing is missing. Some will even do the laundry for you, handwashing. I like how you tell and share your story. I also love to visit Cuba someday. I’ll reference this and someday it might help. planning on going to cuba this summer with a friend of mean.So im reading up so that i know what to expect.This post was extremely helpfull super excited about my trip. Great photos and story. I am very interested in visiting cuba one day and experiencing it for myself. Staying at someone’s house is a way of helping Cuban people live better. And you are not intruding, they are exactly as a B&B, where you have your own private room with bathroom and you are not really interfering with their life unless you want to know them better. I didn’t know about this history! It’s very interesting and I like your articles! Such an amazing story! Additionally the photos are just great! One of the places on my bucket list for sure! The photos look lovely and this post has just made me want to go more!! Love they way you’ve told your story and you photography is amazing. We’d like to see the REAL Cuba, and sharing a house with the locals sounds a good way to go about it! Hi Joanne. Hope you’re doing well? Best wishes. Kevin – Poole Post Office. Cuba is my dream destination. Reading your posts made me want to go there even more!